Sedona Cake Couture: It's Christmas at Sedona Cake Couture! My 5 year old grand-daughter Breanna was a big help in the kitchen! We had SO MANY cookies to decorate. 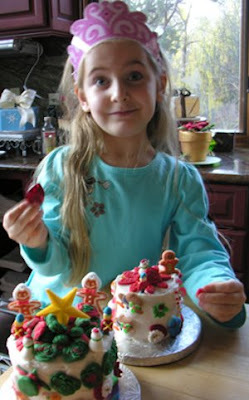 She is a very talented decorator and tells me that she is going to help me make beautiful cakes when she gets bigger! You see her wearing her Tiara - it's her birthday celebration this weekend!! And the very best part was watching her decorate her very own cakes (with no help from her Grandma! She is truly amazing and one of the special loves of my life!!! 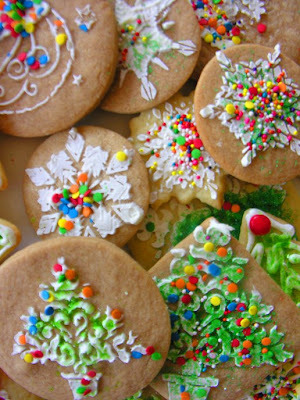 It was fun making the cookies and stuff and it was fun coming to your house! I love you Grandma. I hope you have a fun time at your Challenge.